You may remember your dental team offering to pre-schedule a “recall” appointment for you the last time you were seen for a cleaning. Routine examinations and x-rays are necessary to identify potential dental and medical problems such as gum disease, bone loss, strokes, heart disease, infection, and many other issues. In office salivary DNA and genetic susceptibility testing allows your dentist to identify problems that you won’t find at home with a toothbrush and a bathroom mirror! Committing to routine recare allows for the early detection of many costly dental problems. If cavities go undetected for extended periods of time the treatment options may be limited to root canals, crowns, and possibly the removal of teeth. This is also why it is important to update your x-rays at every recare visit. At Central Dental, you can expect your doctor and hygienist will only recommend necessary radiographs. 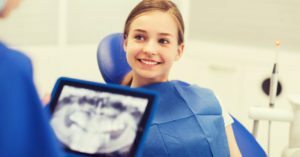 A necessary radiograph is one that is used to diagnose the extent of a dental problem that we already know exists, such as a broken tooth, a cavity, or an abscess. We also must use radiographs as part of an initial or periodic oral examination. In these examinations, radiographs are used to determine whether there are problems in a beginning stage that cannot be seen merely by looking at the tooth or area. Food debris, plaque, and calculus can all cause inflammation of the gum tissue. The purpose of scaling and root planing is to remove all debris, plaque, and calculus from your teeth. The root surface must be made as smooth as possible. Irregularities in the root surface can contribute to gum inflammation because they house bacteria and allow for plaque buildup. Proper brushing and flossing is of the utmost importance once scaling and root planing treatment has been completed. If your doctor or hygienist have recommended any additional periodontal aids, you must use them. Your cooperation is vital if the procedures are to be successful. Your daily dental homecare routine must be both correct and consistent to remain as healthy as possible. Committing to routine re-care allows for the early detection of many costly dental problems. If cavities go undetected for extended periods of time the treatment options may be limited to root canals, crowns, and/or the removal of teeth. If you have insurance, make the most of your dental benefits! Most insurance policies allow a benefit for two examinations and cleanings per year. Taking advantage of these benefits will help you avoid the more costly dental procedures that can and do result from poor oral hygiene and delayed re-care. Don’t let the lack of insurance dictate your care. Many payment options are available to help keep your health on the right track. Dentistry is not just about a beautiful smile; it’s about your overall health and well being! 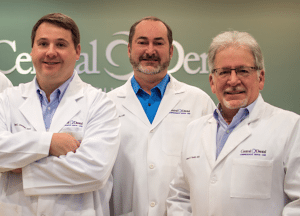 Schedule your initial examination or re-care appointment today, our friendly dental team is looking forward to helping you achieve and maintain dental wellness. You can fill out our form below or reach our Little Rock office at (501) 225-1577 and our Conway office at (501) 327-6453. We look forward to meeting with you!